Will leave you dying to know more. -Rick Riordan, author of the #1 bestselling Percy Jackson series The New York Times bestselling author of the Peter and the Starcatchers and Kingdom Keepers series, Ridley Pearson, brings us the thrilling conclusion to the Lock and Key trilogy. ... read full description below. Will leave you dying to know more. 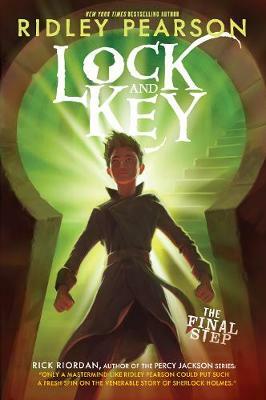 -Rick Riordan, author of the #1 bestselling Percy Jackson series The New York Times bestselling author of the Peter and the Starcatchers and Kingdom Keepers series, Ridley Pearson, brings us the thrilling conclusion to the Lock and Key trilogy. Before James Moriarty and his sister Moria enrolled in Baskerville Academy, they were inseparable-as close to best friends as a brother and sister could be. But since setting foot on the boarding school's campus, James has been different. At Baskerville, he's become cunning, deceptive, ruthless, sometimes reckless. And now that his roommate Sherlock Holmes has been expelled, there's no one left to help Moira figure out what's going on with her brother or to uncover the connection between a recent string of deaths. To Moria, it seems obvious that someone has it out for the Moriarty family. First their father and then their family driver and now their legal guardian-clearly something is afoot. But to get the answers they need, they'll first have to deal with an incriminating photograph, secret safe houses, and powerful enemies. It's a highly original and satisfying take on the Sherlock Holmes series as only master of suspense Ridley Pearson could envision. As Rick Riordan, author of the Percy Jackson series, says, This tale will change the way you see Sherlock Holmes and leave you dying to know more.